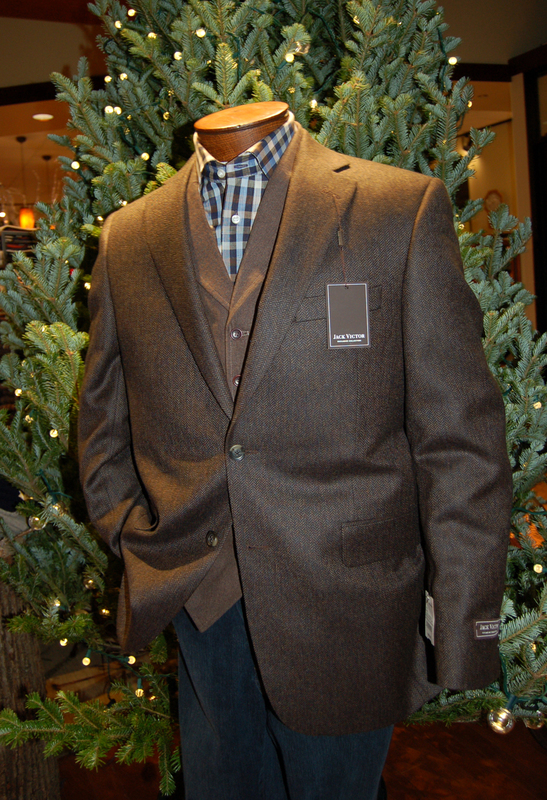 Guys, are you feeling a bit uninspired about what to wear to your holiday parties this year? Not looking forward to de-pilling that sweater vest you wore a few too many times last year (and the year before)? Well dread your holiday wardrobe no longer, there is no need to think typical when it comes to fashionable attire this season. These outfitting suggestions are simple, versatile, and fresh. Our aim is to help you turn one or two garments into multiple outifits suitable for different occasions. Be freed from traditional pressures, you do not have to dress like a Christmas tree to be festive. Red and green are fine colors to wear, but they are not the only colors suitable for this time of year. The colors you wear evoke a mood. Warm browns and rusts and oranges like the fireplace. Cool blues in every shade like ice and snow. Bright reds and purples like holly and wine. Neutral tans and creams like a cinnamon cappuccino. Everyone is drawn to some colors more than others. We encourage you to follow your instincts and allow us to help guide your appearance forward. Fashion rules are both said and unsaid. Some trends come and go quickly, some trends are slower moving and last longer. Colored pants, for example, are everywhere right now. We are seeing them for spring 2013. They are fantastic, but in my opinion this trend is faster moving. However, I don’t foresee slimmer fit suits and pants vanishing anytime soon. Similarly, flat front pants and non-button down collars are increasing in production. I mention these things as you consider what direction you want your threads to move toward. What can you wear a tie with? What about pattern on pattern? Denim with a sportcoat? Consider something new this holiday season. Everything we have to offer is first-class. To set you at ease, The Foursome is here to help you dress felicitously. How formal is too formal? What outfit suites what festivity? Below you will find seven scenarios, one or more you likely already have on your calendar. Consider each outfit a starting point, to which there is great potential for dressing up or down. Infinity the limit. They picked over-the-top fancy, you pick the color. 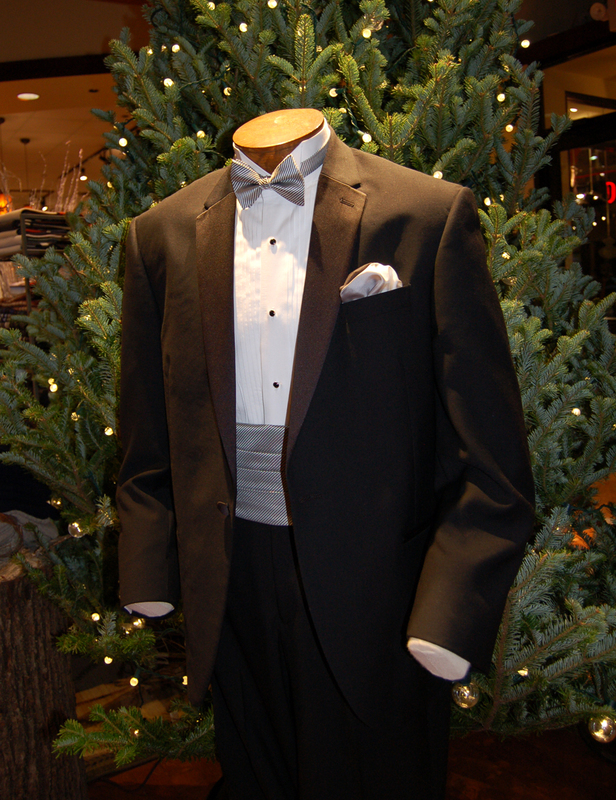 Renting or buying a tuxedo is not so boring after all. Select your favorite tuxedo accessories and be as distinct as you like. Alternatives: For something seasonal, try a red vest and bow tie with a Christmas patterned pocket square. We recommend you dress excessively particular for this event. Let them take your picture in black and white to bring out the contrasting tonal patterns between shirt, tie, and pocket square. This elegant ensemble is timeless, yet sleek and up to date. The suit is sure to be a foundation piece in your wardrobe with potential for the future. 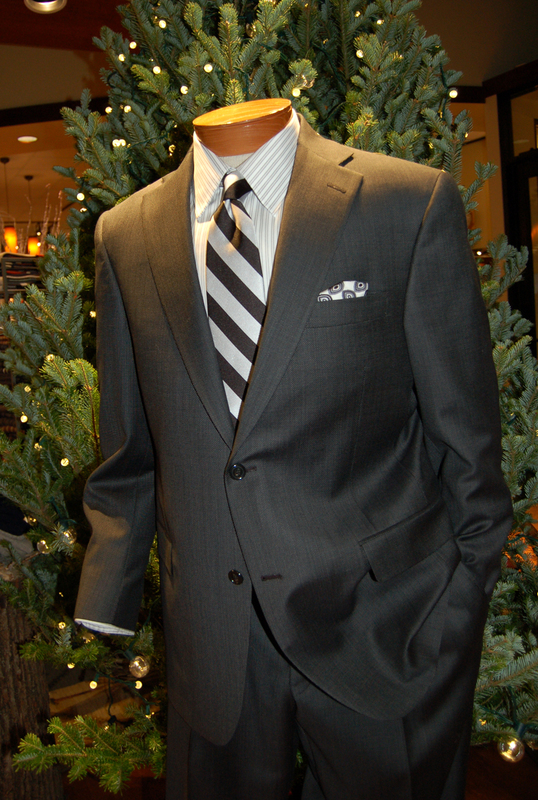 Alternatives: Wear the suit with a solid shirt and pair with patterned bow tie or a fascinating tie by Dion. Who said you should wear red to every holiday party? Some traditions are worth breaking. A color palette of rich blues and navy and gray create a sophisticated look while checks and dots add some flirtatious flair. The navy cashmere coat is as classic as they come and can be worn in a hundred different ways. Alternatives: Dress it down with a pair of St. Croix corduroys and a knit turtleneck. If you haven’t worn a sport coat with denim before, wait no longer. This outfit is the perfect example of how to do it in style. Grainy browns in the vest and sport coat paired with an extraordinary shirt by St. Croix adds a bit of blue that compliments the denim. Alternatives: Take the coat off and admire the vintage looking vest with contrasting fabric on the back, plus you have a new outfit for date night. 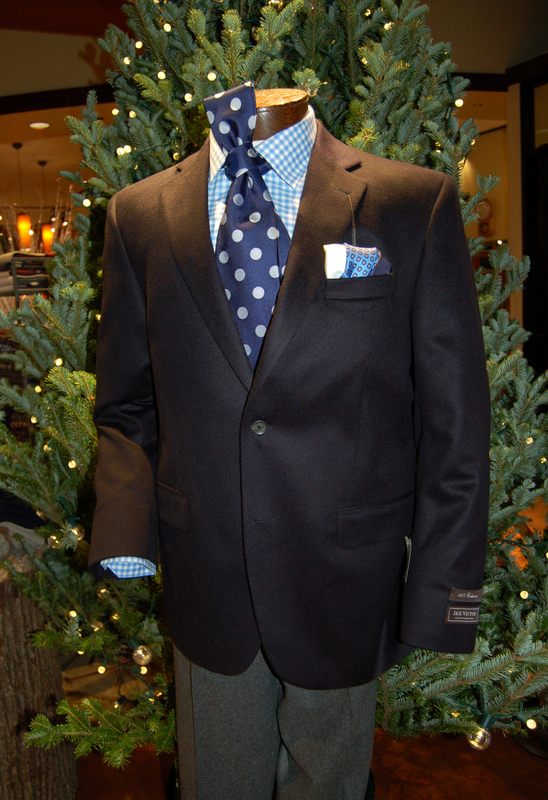 To dress up the sport coat, wear it with flat front slacks and a patterned sport/dress shirt. Robert Graham is nothing but fashion, and this outfit is fresh attire. 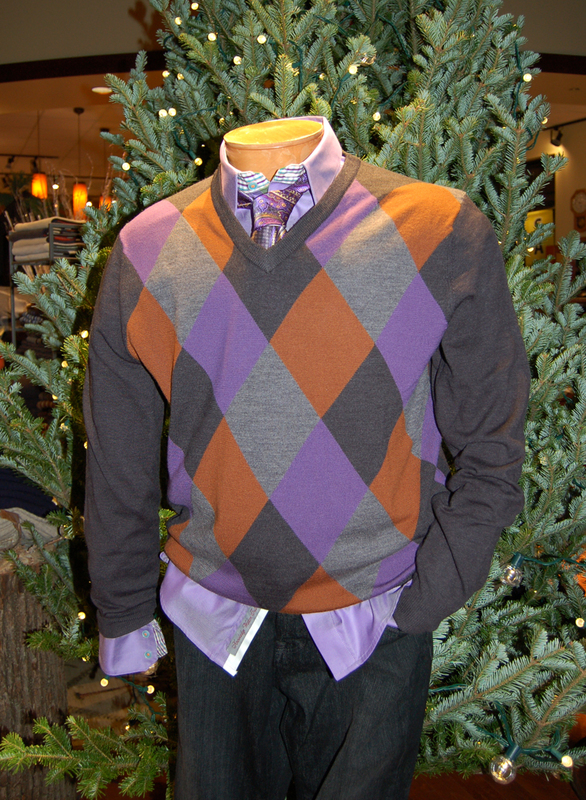 A purple, gray, and camel colored argyle sweater with matching paisley tie will help you celebrate the season with flair. Black washed denim is something you want in your closet. These jeans have dressing-up ability. Alternative: Take the sweater off, roll the cuffs, tie or no tie, and you are ready for the city. For a totally different look, wear the sweater with a mock turtleneck and charcoal flat front cords. Traditional but not typical. An Italian inspired Visconti shirt adds festive glimmer with silver threads woven in. Don’t forget to turn your cuffs up for a holiday worthy pattern. 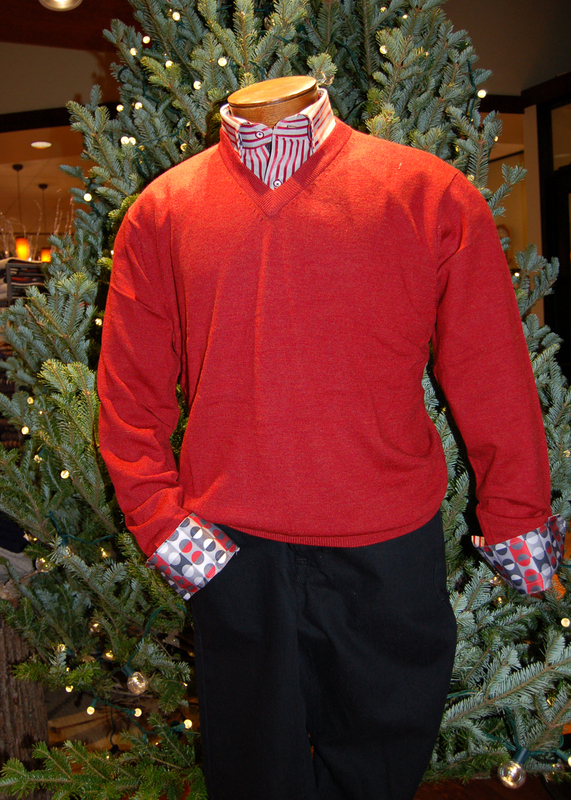 The red wool sweater by Raffi is a must have for your wardrobe. At a great price point, try another color and take home two. Alternatives: Take the sweater off and you have a new shirt for happy hour. 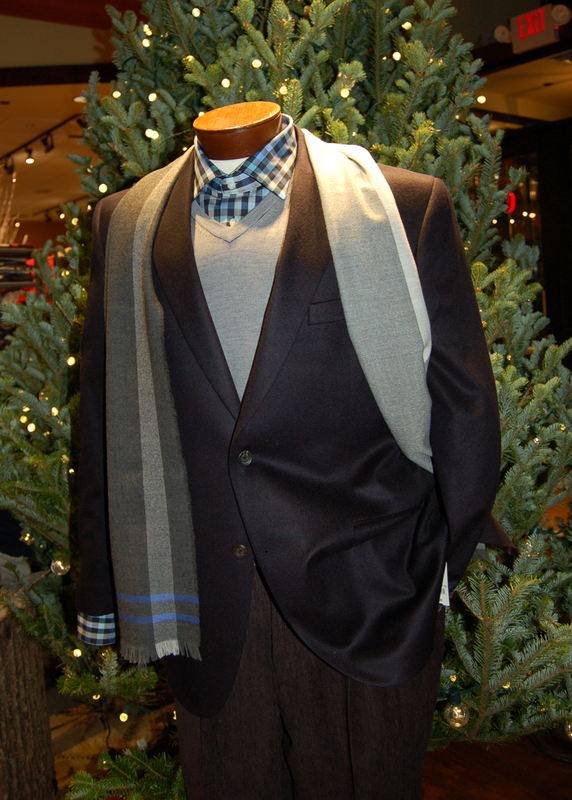 To dress it up, wear the shirt and sweater with a pair of charcoal Zanella pants or wool slacks. You could even throw on a black sportcoat. In typical Tommy tradition, you get style with comfort. You won’t want to take this outfit off at the end of the day. These light tan cords go with anything and are full of warmth and seasonal texture. Silk Tommy shirt should be worn untucked and looks stunning with this black zip top. It is a cross between a sweater, sweatshirt, and jacket. Great detailing. 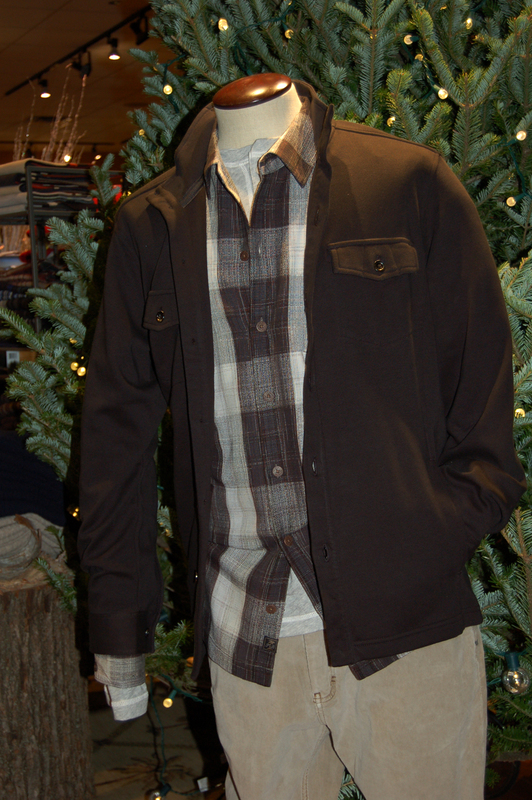 Alternatives: For a dressed up snowy look, wear the cords with a Scott Barber shirt and cream cashmere sweater by Raffi. Or try our new 5 pocket travel pants with the silk shirt. Join us for a special Men’s Night at The Foursome on Thursday, Nov. 29, 2012 from 5:00 to 8:00 p.m. Our expert sales associates – your personal shoppers for the evening – will help you assemble a great holiday wardrobe. Plus, enjoy tasty appetizers from Jake’s Grille, a free shoe shine, shoulder massages and hair consultations from Sport Clips stylists, and 20% savings on your purchase that night. This entry was posted in Holiday and tagged 34 Heritage, Beth Dougherty, christmas, fashion trends, Hart Schaffner Marx, holiday attire, Robert Graham, Seaward & Stearn, St. Croix, suits, The Foursome Store, tommy bahama, wardrobe building by The Foursome Fine Apparel and Shoes. Bookmark the permalink.